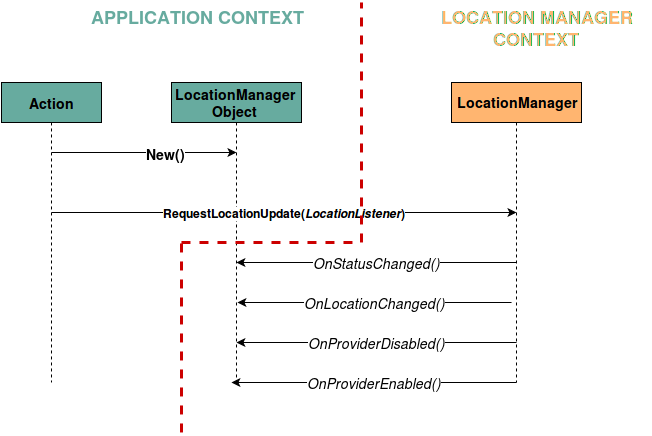 In order to retrive the correct informations about the user location on a mobile device, the application uses the LocationManager class located in the android.location package. This package is an API that is part of Google Play Services and provides a more powerful, high-level framework that automatically handles location providers. Using the LocationManager class, the application can obtain periodic updates of the device’s geographical locations (Longitude, Latitude, Altitude). To get user location in Android is done using callback method. The application has to indicate that it would like receive location updates from the “Location Manager” object by calling the requestLocationUpdates() and passing it a Location Listener, that implement a set of usefull callback that the Location Manager call when the user location changes or when the status of the service changes. this handle is used for controlling location updates. provider: The name of the provider with which you register. In this case the provider requested is the “NETWORK_PROVIDER” (it is possible use also the GPS_PROVIDER), This provider determines location based on availability of cell tower and WiFi access points. Results are retrieved by means of a network lookup. minTime: The minimum time interval for notifications, in milliseconds. minDistance: The minimum distance interval for notifications, in meters. Each 10 meters or every 1 minute, the LocationManager is called and and calculates the GPS coordinates with the getLastKnownLocation method of the locationManager class. This method return the exact location of the device: latitude, longitude and altitude providing by the NETWORK_PROVIDER. if both are not available, is not possible calculate the location and it is shown a Dialog for the activation of the GPS/WIFI sensors. Used to calculate the distance between two different location passed in input. This method uses the function distanceTo belonging to the android.location.Location class. it returns the approximate distance in meters between this location and the given location. this permission allow the appllication to access precise location.